Well, it’s that time of year again! Either your kids have just started school, or they are about to start school any day now. My kids start school on Tuesday. They’re both so excited, and ready for this new adventure. This will be my son’s first year of school, and thus his first year riding the school bus. I’ve been trying to get him prepared for his first big bus ride and thought that a cute snack sure wouldn’t hurt. The kids gobbled this snack up in seconds. It was a real winner. It was also really simple to make! 3 slices of cheese—marble or cheddar, or both! 1. Using your knife and your cheese slices, carve out a school bus shape. Place these school buses on a plate. 2. Place a cracker on top of each cheese bus. 3. Place 2 black olive slices on each bus for the wheels. 4. To make a sun, place an orange slice with slices of baby carrot at the top of the plate. So simple, and so fun. 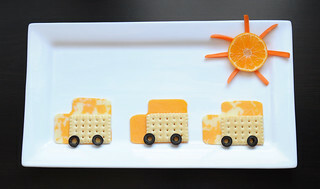 If you have a little one going back to school, or a kid who rides the school bus, they’ll be sure to love this cute snack!